The Gospel Roots of Rock and Soul project is a celebration of Black gospel music and its influence on early rock and soul music. We asked gospel radio host and historian Jacquie Gales Webb too put together a radio special with songs that illustrate how Black gospel has impacted and influenced secular music. She’s a contributor to our project and has added her incredible musical passion, knwoledge, and perspective on the music to the project. 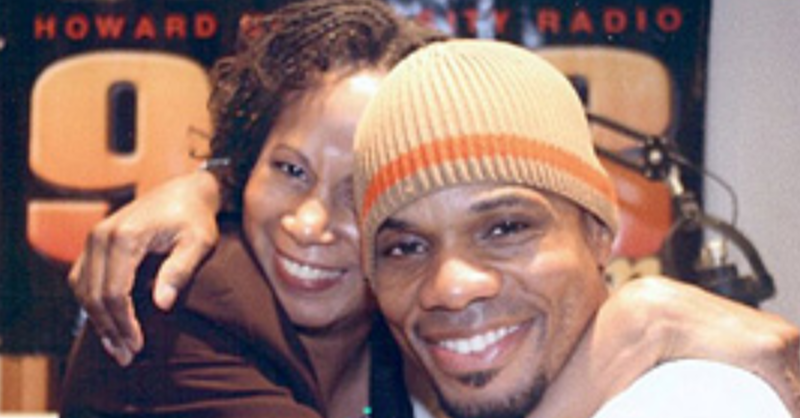 That’s Jacquie above, with Kirk Franklin. We knew Jacquie would be the perfect person to do this. Jacquie is a Peabody award-winning producer, and the host of the Sunday Afternoon Gospel music program on 96.3 WHUR and WHUR.com. In 2015, she marked her twenty-fifth year of hosting the show. The Indiana University Archives of African American Music and Culture established the Jacquie Gales Webb Collection in 2016. It is a repository for collected papers and production materials related to her career. The collection provides a resource for scholarly research and course development on media and music history and has been a resource for books, publications, and an online exhibit on the Golden Age of Black Radio for the Google Cultural Institute. In 2014, she was inducted into the WERS Hall of Fame at her alma mater Emerson College for her broadcasting career achievements. The National Convention of Gospel Choirs and Choruses presented Ms. Webb with a Lifetime Achievement Award in 2012 for continuous service and support of gospel music. She was also named by the Washington Examiner newspaper as one of the top ten “movers and shakers in gospel music” in the Washington metropolitan area. Her performance and body of work in the gospel music industry was instrumental in WHUR receiving the 2009 Stellar Award for Major Market Station of the Year. Gales Webb produced two gospel music CD Compilations for Time Life and is a featured gospel music expert in the film documentary “Rejoice and Shout.” Her other awards include the George Foster Peabody Award from the University of Georgia for the radio documentary “Black Radio: Telling It Like It Was”, the Alfred I. Dupont silver baton from Columbia University and six local EMMY Awards and 14 nominations from the National Academy of Television Arts and Sciences. Jacquie also works with public radio stations, networks, station managers, producers and consultants to support and improve the nation’s public radio system as a project manager for the Corporation for Public Broadcasting. She serves on the community advisory boards of the John F. Kennedy Center for the Arts and the Foundation for the Advancement of Music Education. She served on the alumni board of Emerson College for six years and is current president of the DC Emerson Alumni Chapter. She also served as vice president of the National Capitol Area Chapter of the Alliance for Women in Media and on the board of the Prince Georges County, Maryland Arts and Humanities Council. During Jacquie’s show you’ll hear music from some of the gospel legends including Sister Rosetta Tharpe, James Cleveland, Sam Cooke & The Soul Stirrers, Dorothy Love Coates, The Swan Silvertones, Kirk Franklin, Dorothy Norwood, Andre Crouch, Marion Williams, the Mighty Clouds of Joy, and others, and the influence this great music has had on Little Richard, Prince, Funkadelic, Aretha Franklin, Whitney Houston, Gladys Knight, Tye Tribett, and yes, even Snoop Dogg. Listen to the show below in the player. This article and audio piece was written for WXPN’S GOSPEL ROOTS OF ROCK AND SOUL and produced by Jacquie Gales Webb, Bruce Warren and Bob Bumbera. GOSPEL ROOTS OF ROCK AND SOUL has been supported by The Pew Center for Arts & Heritage.